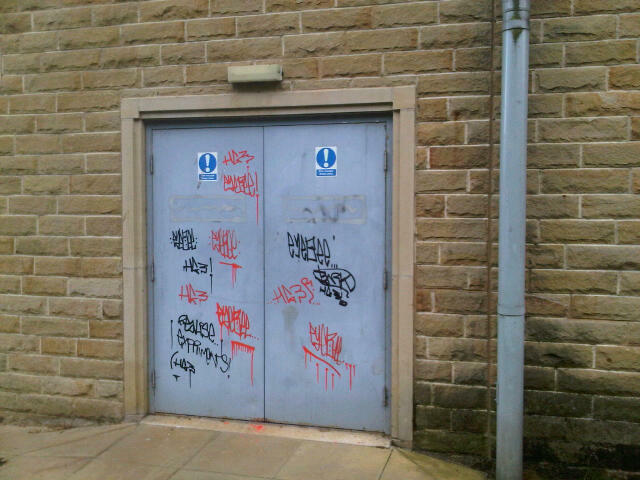 Harrogate police are appealing for information after a series of graffiti tags appeared around a local leisure centre. 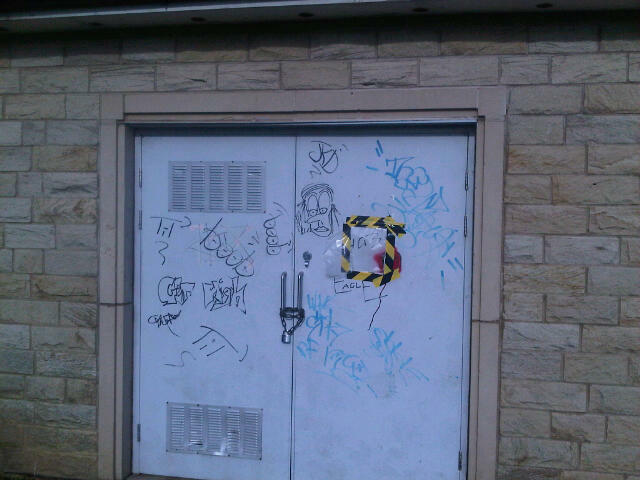 Taggers targeted the Hydro Leisure Centre off Jenny Fields Drive, covering all the fire doors around the building with their mark. 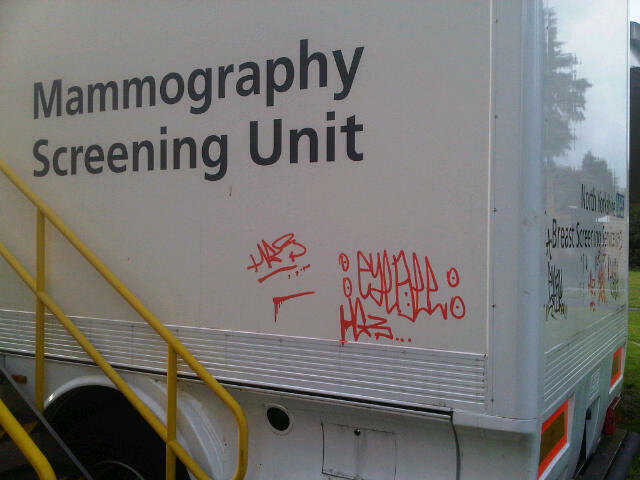 They also defaced a mobile NHS breast screening unit which was parked next to the leisure centre, a bus stop and two telephone exchange boxes next to the Hydro underpass. 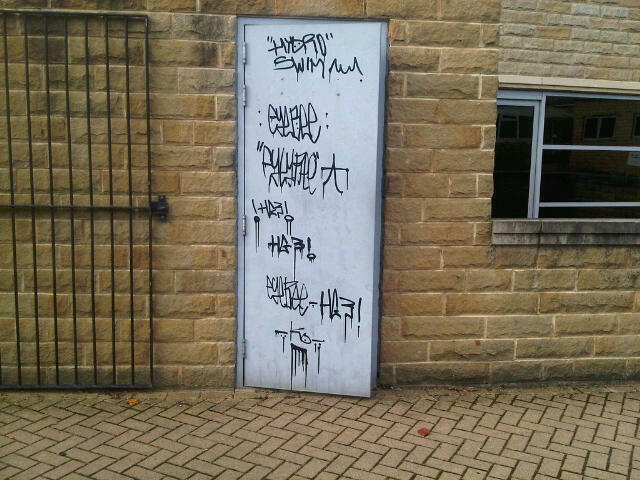 It is believed the tags were painted on Friday 12 October 2012. 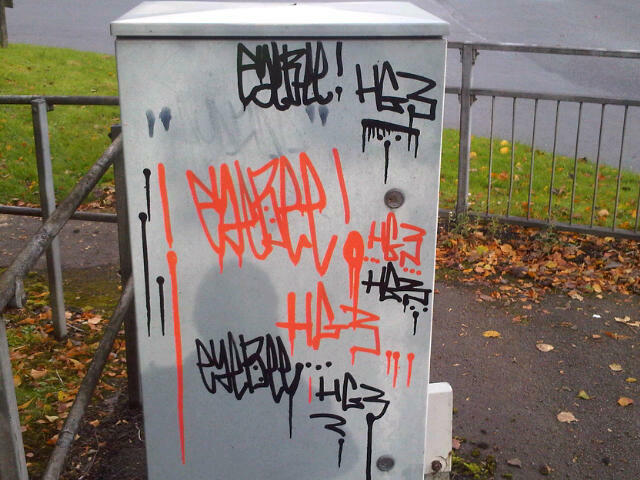 Officers have released images of the tags and are urging anyone who can help them to identify the offenders to come forward. 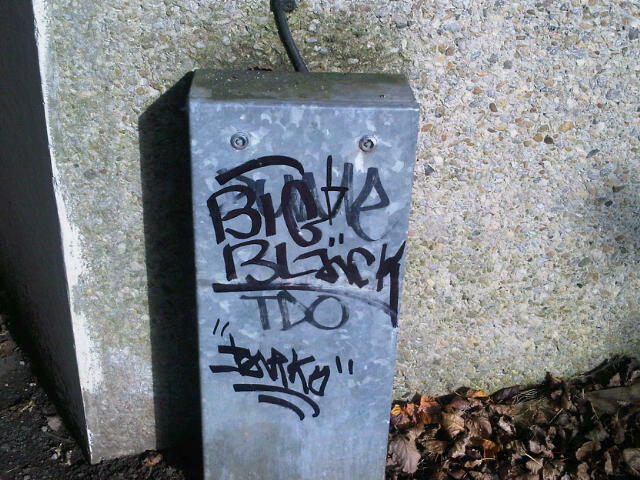 These graffiti tags are very unsightly and not very pleasant for residents and people who work in the area to look it. It is also very inconvenient, costly and time consuming to have them removed. The tags are quite distinctive and I am appealing to anyone who knows who is responsible to contact the police or Crimestoppers with information. I would also appeal to anyone who witnessed any suspicious activity in the area at the time of the incidents to get in touch. Anyone who can help officers with their enquiries is urged to contact North Yorkshire Police on 101 – select option 2 – and ask for Michael Smith or Harrogate police. What kind of value system allows a person to vandalize a truck as shown here? Why do people do graffiti? They start off thinking it is harmless. They come to see it as a right of self expression, a freedom of speech. Others glorify it as art. Some see it as a way to elevate their status. The more that there tag name appears around town, the cooler they become. Some people get addicted to doing graffiti. It provides a rush and excitement – doing it without getting caught. To the victims of graffiti vandalism, it leaves a repair bill. 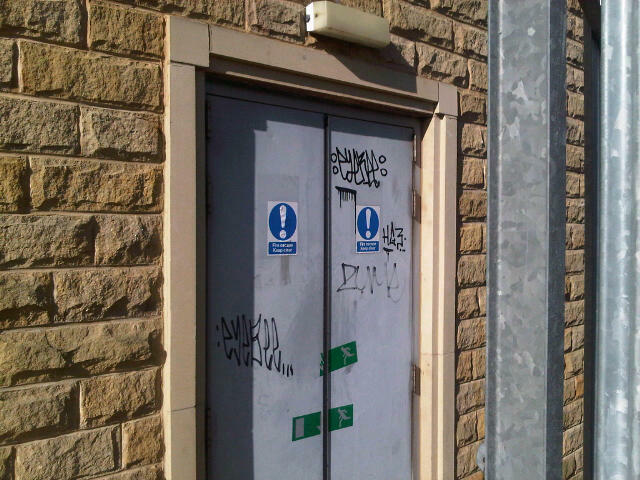 We need to do more to prevent and control crimes of graffiti vandalism. Photo -documenting vandalism helps law enforcement elevate the charges against a graffiti vandal if and when they are caught. The higher the documented damages the more likely that a meaningful sentence will be imposed against the vandal. Prompt removal of graffiti is always important. You don’t have to be a graffiti expert or consultant to realize that accumulated graffiti tends to attract even more graffiti vandalism. 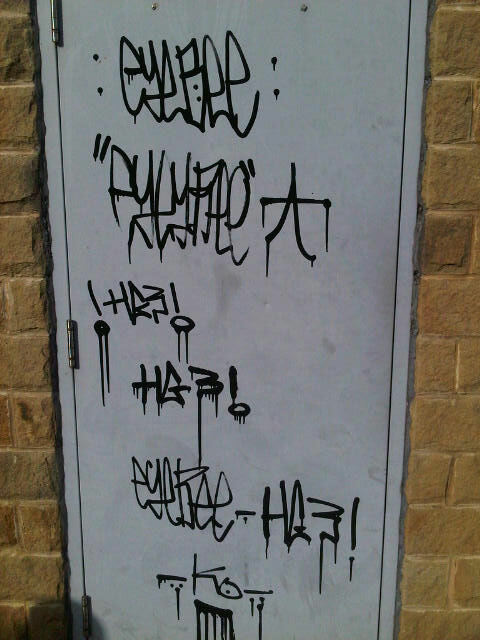 We will only stop graffiti through preventative education as advocated at http://www.DefacingAmerica.com . We need to foster attitudes among kids that see graffiti for what it is, destructive and inappropriate. Graffiti hurts us all. They’ve also done all around the St Andrews and St Nicolas roads IN Harrogate but as thats a “not posh” area of Harrogate the authorities have ignored the fact that every flat surface is being daubed in “N.Y.S” graffitti tags. Next Story Next post: 13-vehicle collision on A1 near Bedale: Did you see a tipper truck with a shredded rear tyre?